HOMELESS SERVICE HAVE thanked members of the public who got in touch overnight out of concern for people they had seen sleeping rough in the severely cold weather. Dublin City Council’s homeless executive had 220 reports through its rough sleeper alert system, which it is asking members of the public to use if they have a concern about a homeless person. You can find the reporting system here. “This has enabled the Housing First outreach teams to locate and engage with people sleeping rough and work with them to access shelter and more importantly the teams have been able to engage with people who would not normally come into services,” the homeless executive said this morning. The Inner City Helping Homeless voluntary organisation will have outreach teams working again tonight and they can be alerted to anyone sleeping rough by calling 01 8881804 or 085 8389281. In Kildare, the Peter McVerry trust is operating the freephone line, which is 1800 804 307. Meath County Council advises members of the public use its out of hours number, 1890 445 335. Louth County Council can be contacted out of hours on 1890 202 303. For services in Kilkenny, you can call Good Shepherd Centre on 056 7722566 or the council’s emergency call centre number 056 7794145. In Cork, you can contact the homeless persons unit on 021 4963 052. Cork Simon has an Emergency Shelter on Anderson’s Quay. Their number is 021 4278 728. The number for the Society of St Vincent de Paul in Cork is 021 4317 899 and Pathways, which is for male teens aged 14 – 17 yr old can be contacted on 021 4507 050. The Limerick Homeless Action Team can be reached on its freephone out of hours number: 1800 606060. In Galway you can call Cope homeless services on 1800 788887. To alert services in Kerry, you can call Arlington Lodge shelter in Tralee on 066 719 3800. All of the local authorities have expanded their emergency accommodation provisions for the duration of the storm. Each of the local authorities have a general out of hours emergency number which can also be used and as a last resort, you can contact your local garda station. Taoiseach Leo Varadkar earlier today acknowledged that the latest figures, which showed an increase in the number of people presenting as homeless, “are bad” and “distressing”. In total, there were 1,517 families with 3,267 children staying in emergency accommodation in January. This marks a rise of 109 families and 188 children since December. There were 5,837 homeless adults in emergency accommodation in January, a rise of 158 on the previous month. He said the rise in the figures is “disappointing” and shows government will have to redouble its efforts. “It is going to take time to get on top of this problem,” Varadkar said. At the moment, he said his main concern is people who may be sleeping rough during the severe weather over the next number of days. 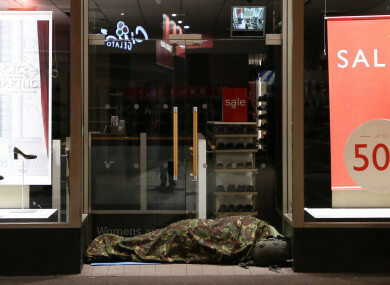 Email “Here's what to do if you see a homeless person sleeping rough tonight ”. Feedback on “Here's what to do if you see a homeless person sleeping rough tonight ”.